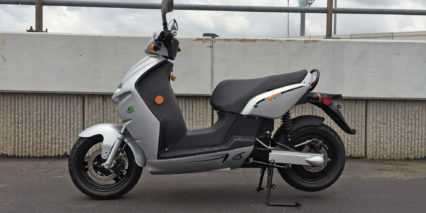 The Vmoto E-Max 120S is an electric moped or “scooter” capable of reaching higher top speeds (40 to 50 miles per hour depending on software configuration) delivering a moderate range of ~30 miles per charge at a good value. 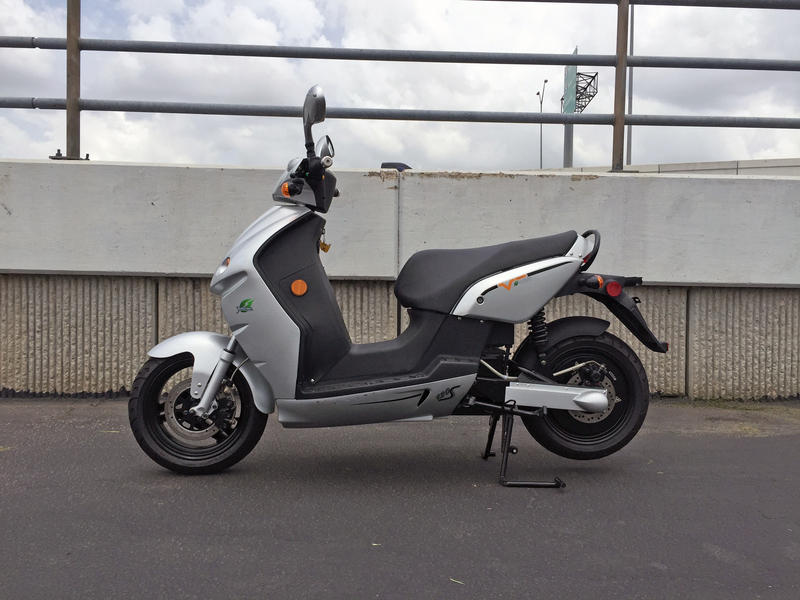 What sets the unit apart from other electric mopeds is its hub motor style drivetrain. 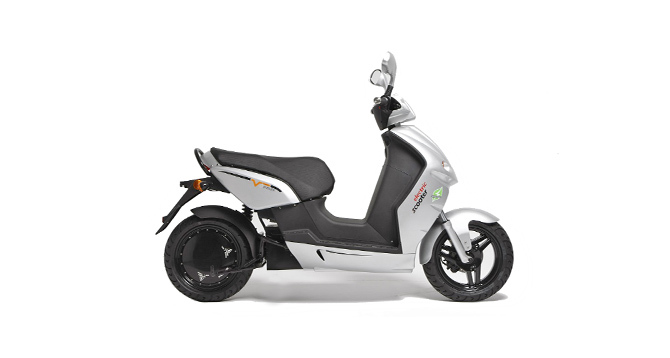 Instead of relying on a chain or belt like many other mopeds, this scooter is propelled by a durable and simple 4,000 watt gearless direct drive hub in the rear wheel. The unit I tested was from 2013 and is no longer being produced or sold new but still held up very well (even in a heavy downpour). 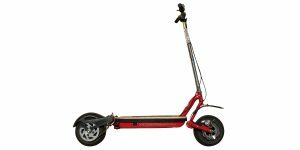 There’s an interesting historical element worth sharing here, the original E-Max scooters were designed in Germany and produced in China but later acquired in a somewhat hostile takeover by Vmoto (an Australian company) and subsequently rolled up into the Chinese manufacturer who had been producing them all along. 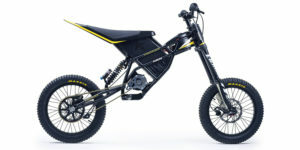 In short, quality dropped a bit, the designs remained largely unchanged and the E-Max brand changed hands while a new German company called Govecs emerged to take its place. 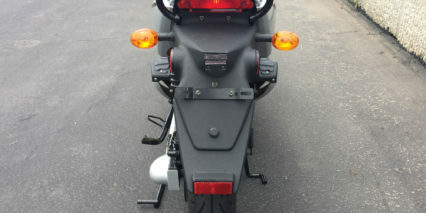 For what it’s worth, I tested this unit while earning my motorcycle license in the United States and it felt comfortable and intuitive though a bit heavy compared with newer Govecs models because it uses Lead Acid batteries vs. Lithium-ion. That’s what the S in the 120S stands for by the way… Silicone Sealed Lead Acid. 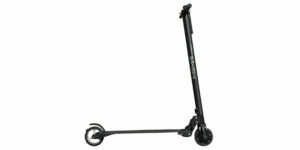 If you see this scooter somewhere for sale it is likely used and the batteries would be worth testing because they will likely cost over $500 plus labor to replace. As mentioned earlier, the motor is the real star of the show here! Offering 4,000 watts of power it’s quite zippy (even with the increased weight of the bike). Compared to some other drivetrain designs this one is simple and almost maintenance free. 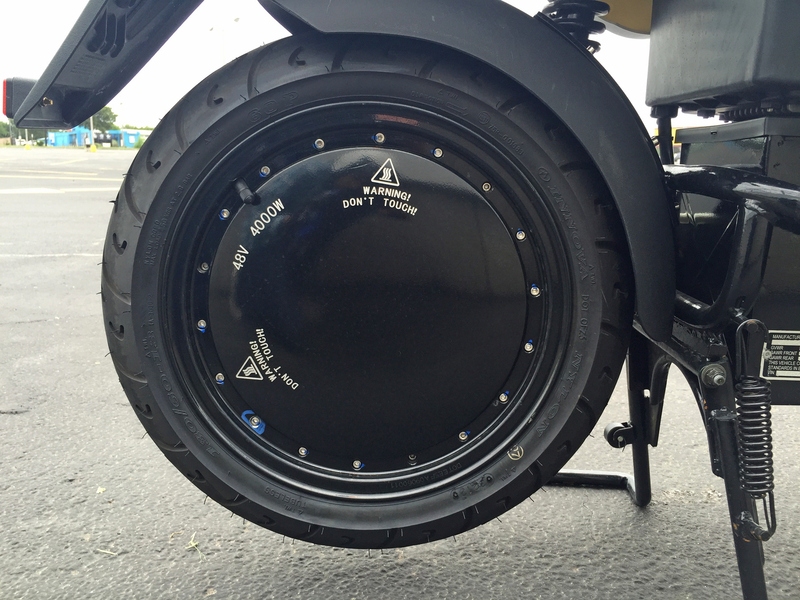 One downside is increased unsprung weight which adversely impacts suspension performance. 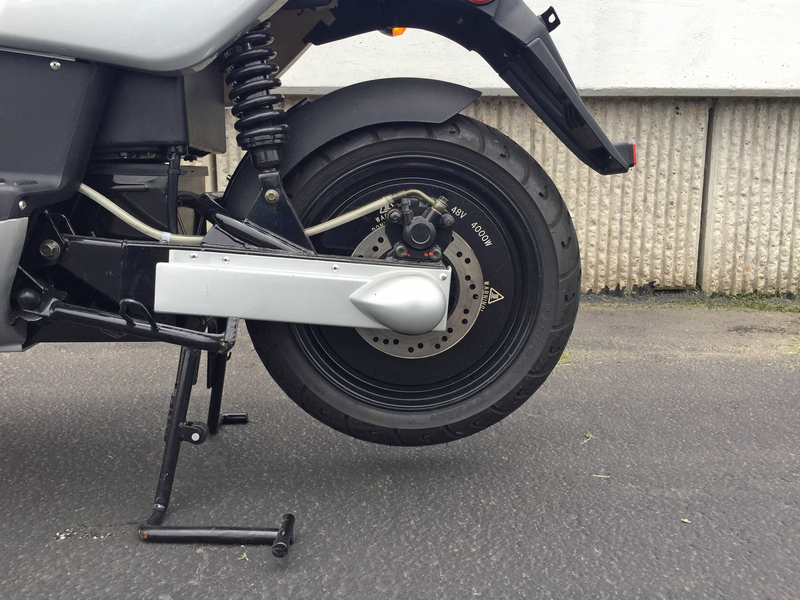 This isn’t a huge deal for around town riding but it might change your focus from chain or belt tightening to suspension recharging. 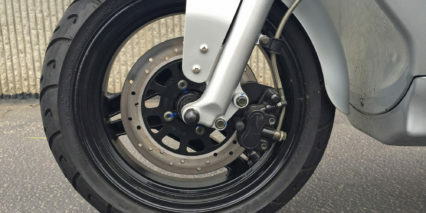 The swing arm that connects the main body of the bike to the rear wheel is single sided and this provides easy access to the motor itself on the right side of the bike. 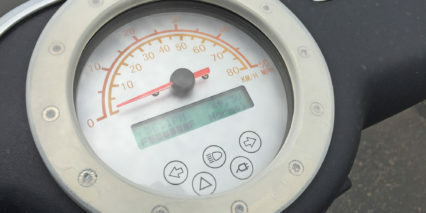 The motor can heat up during use so be cautious when touching it, thankfully it isn’t near your legs while riding and shouldn’t present any great risks during normal operation. The motor operates very quietly during rides as shown in the video review above. 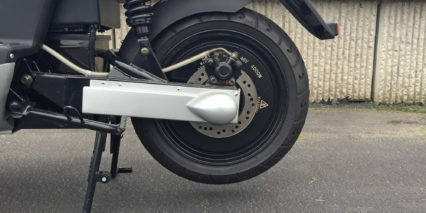 I was impressed and delighted while testing this bike but do believe the motor itself is heavier than canister designs used on some other bikes, at ~420 lbs the biggest complaint I have overall is weight. 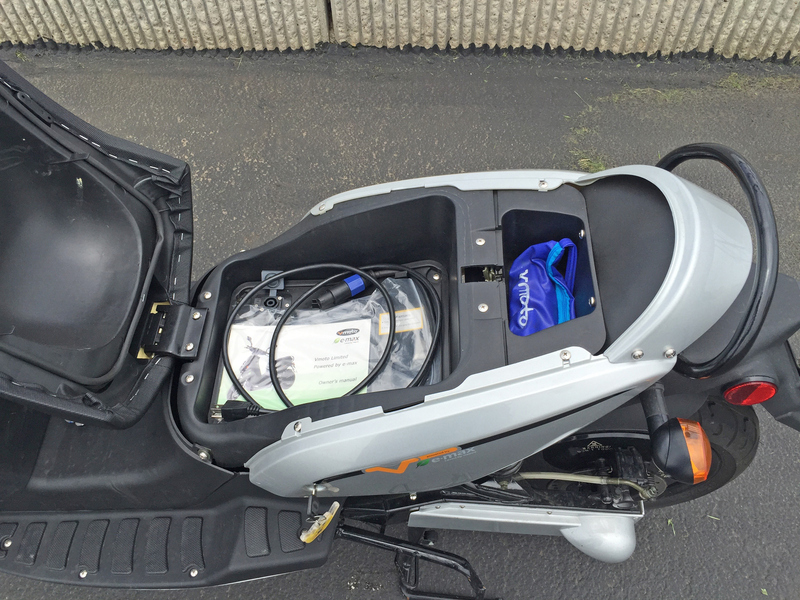 Speaking of weight, the Silicone Lead Acid batteries powering this bike are quite heavy. They are much less expensive than Lithium-ion but also last half as long and can be more prone to degradation if discharged completely. 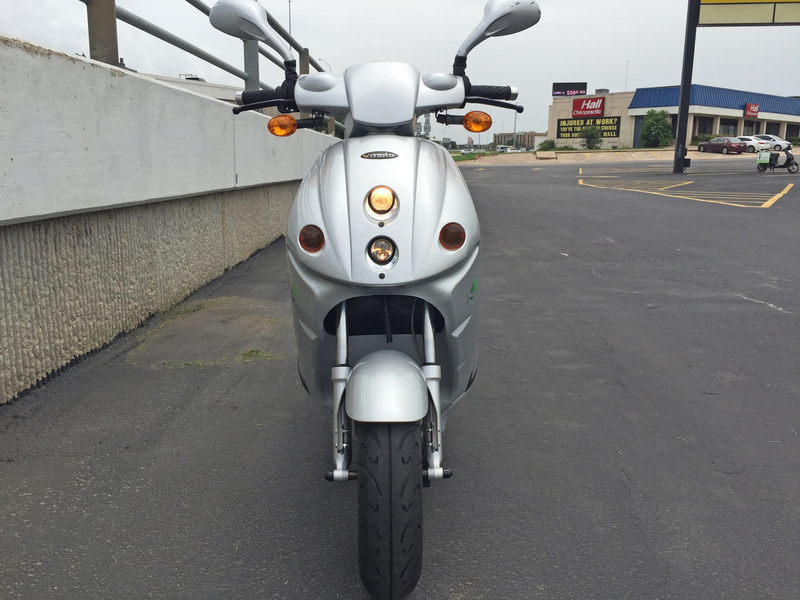 For under $5k the Vmoto E-Max is an impressive machine but it emphasizes value and the weight thing can be a real deal killer if weight savings is one of your primary interests in e-scooters. 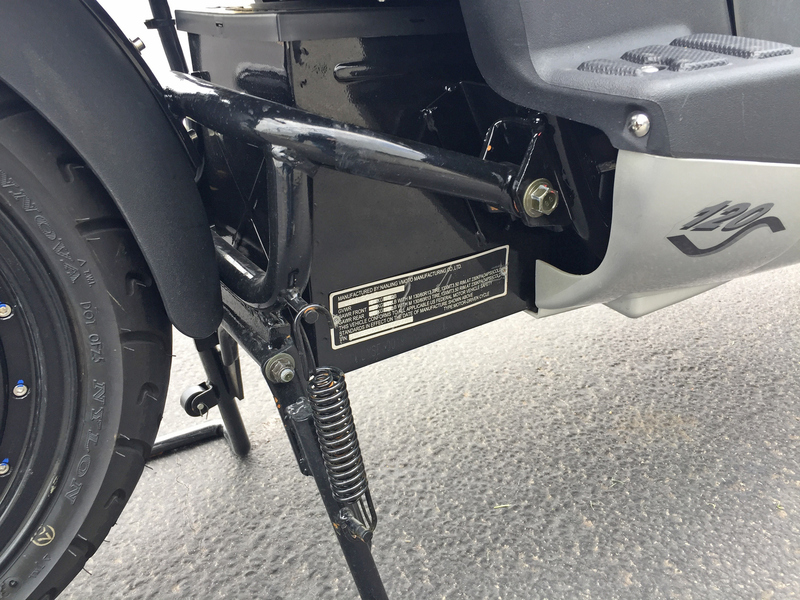 I got to ride this unit back to back with newer Govecs machines and it was a lot less comfortable to start and stop from, more like a traditional gasoline powered motorcycle (which tend to be heavier). 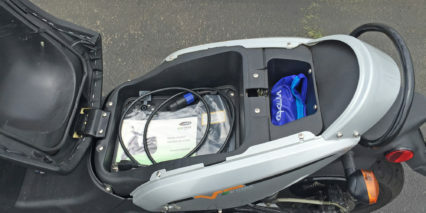 The pack offers 48 volts of power and 60 amp hours of capacity (nearly 3 kilowatt hours of juice) and consists of four 12 volt batteries wired together in series. 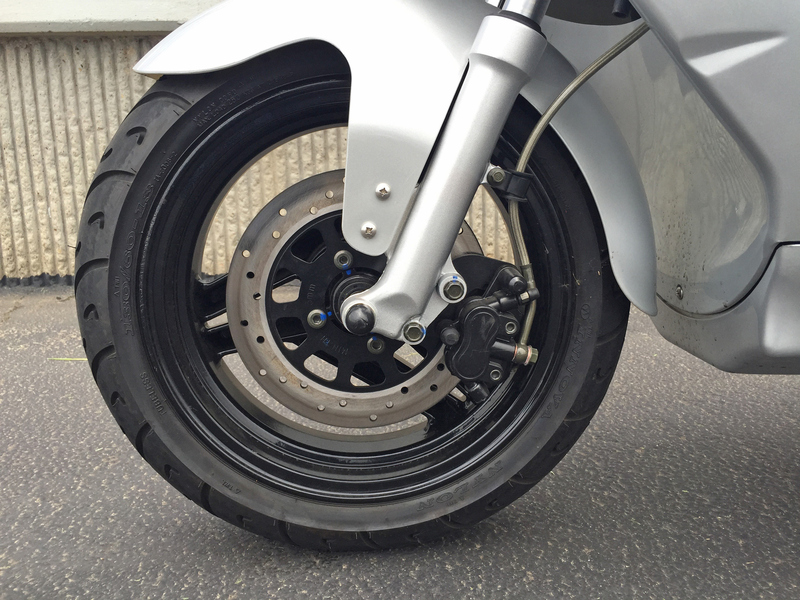 All of the cells are stowed in the floor of the bike just in front of the rear wheel which keeps weight low and centered (and unsprung). Even when riding in the rain and through puddles late in the day I had no issues or concerns about potential issues. 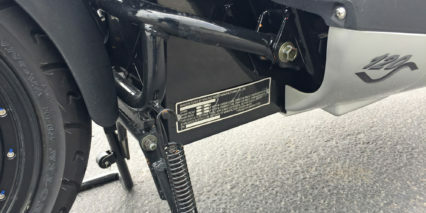 Please note that I never rode through water deeper than two inches, you might be asking for trouble if you completely submerge the deck and motor on this bike. 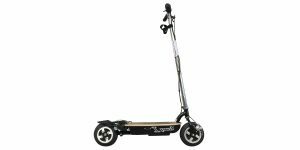 Operating the E-Max 120S is fairly straight forward, just hop on and kick the kickstand up then insert the key and twist. 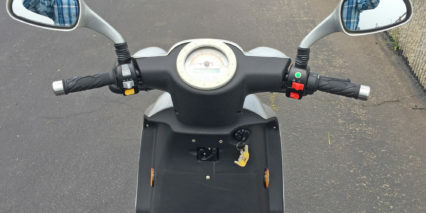 From here you can operate the headlight (switch to brights) as well as the turn signals (I love the light chime they make when active) and honk the horn. 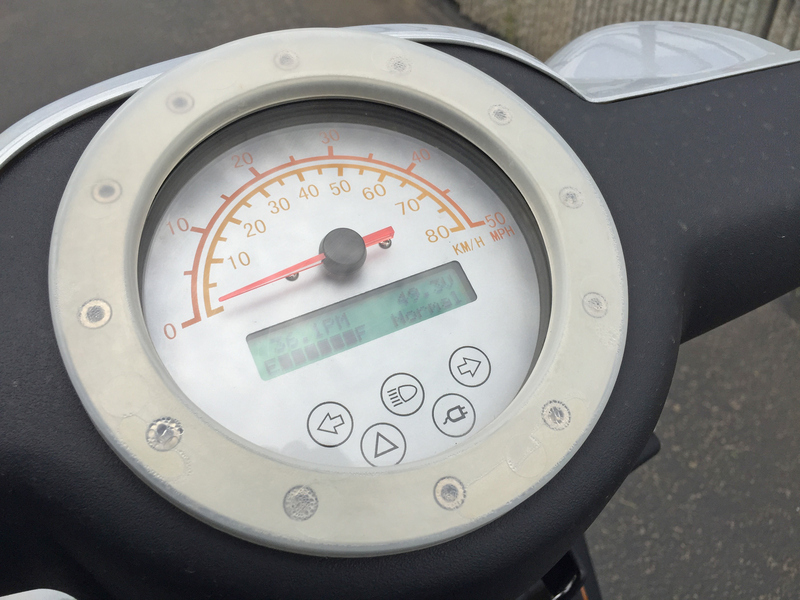 At any time you can twist the full-grip throttle on the right bar and the bike will take off… silently ;) The cockpit is simple and clean with a readout for speed, battery level and odometer. You’ve got adjustable mirrors that really work well (I prefer them over the newer Govecs designs because they are larger) and there’s a nice clip for hanging a personal bag or purse. Under the seat is a cozy storage area (that locks using the primary key). 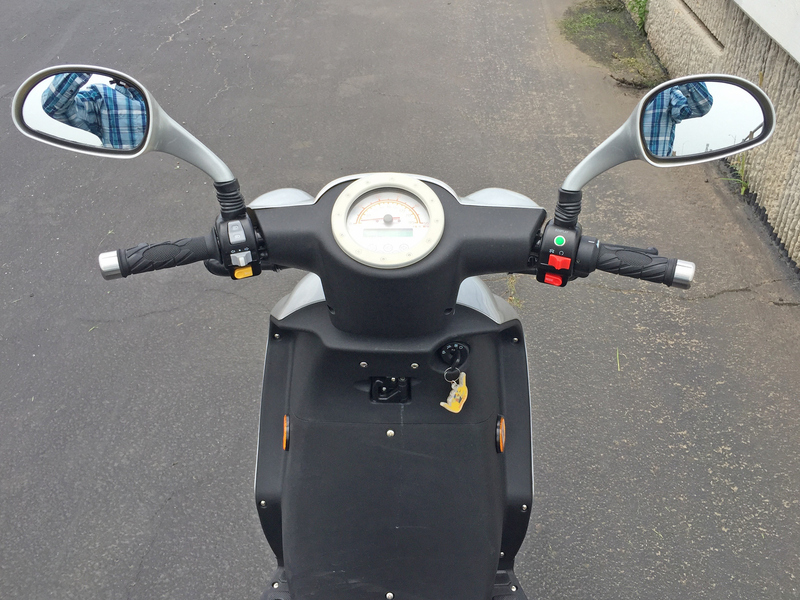 It’s much what you’d expect from a scooter but very simple compared to a motorcycle… No clutch or gears to worry about here, just a smooth and intuitive variable speed throttle. 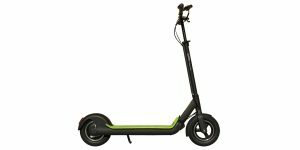 For an electric scooter in this price range the top speed is very impressive and I like the ability to switch to “slow mode” for training or neighborhood riding purposes. Doing so will greatly increase your range. 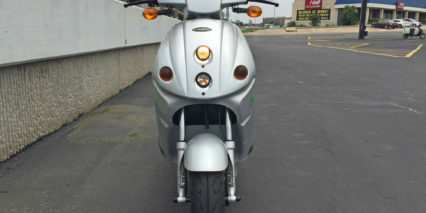 At the end of the day, this bike feels kind of special to me. It’s affordable but also fairly capable in terms of performance. 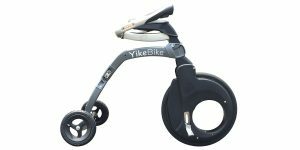 It’s durable enough to be used as a training bike for years on end and even though it’s heavy, replacing batteries is a lot less expensive than if it used Lithium-ion cells. The hub motor design feels bulletproof and the suspension was comfortable enough, the lights worked, the fenders kept my pants dry and the rainbow of color choices adds an element of personalization. I was sad to hear about the hostile takeover of E-Max and the subsequent drop in quality but this thing is so simple, it doesn’t feel like many things can really go wrong. 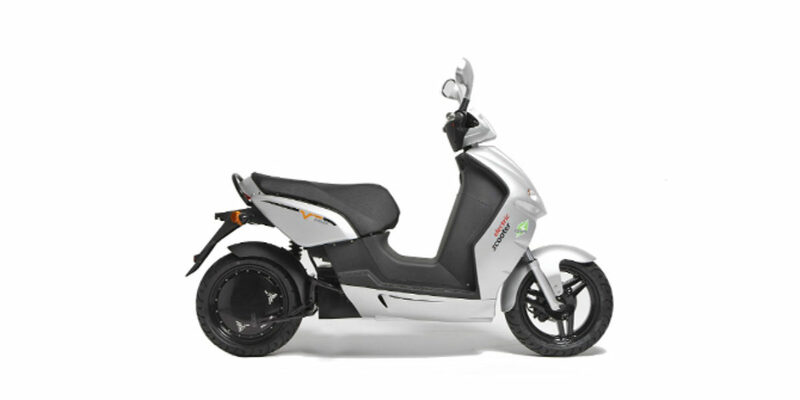 If you live in Europe, you probably see these machines zipping around quite frequently but here in the US it seems novel and is definitely a great unit for learners transitioning to motorcycles or higher powered electric bikes. 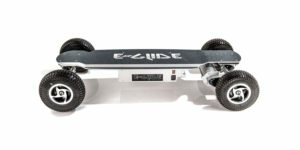 The store I tested this at was based in Austin Texas and is called Electric Avenue. 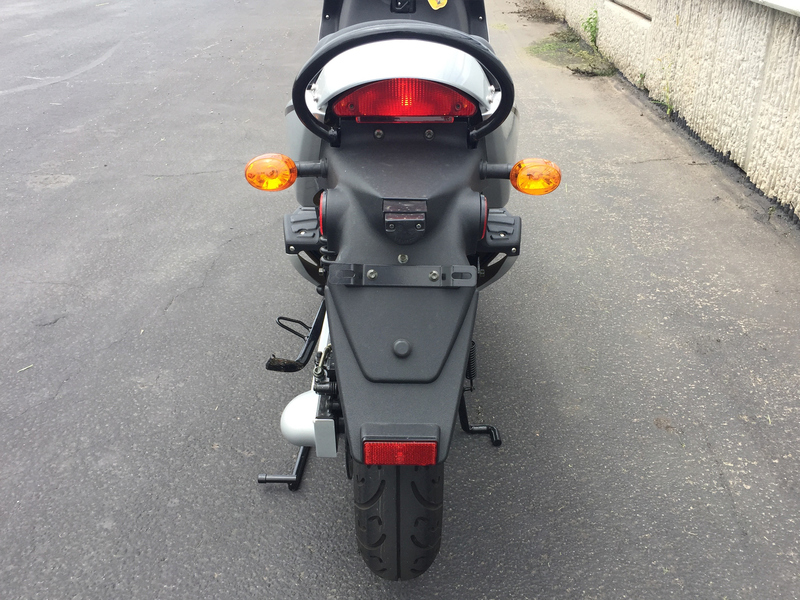 If you want to take a test ride, make a purchase or earn your motorcycle license on a quiet, light weight machine then give them a call. 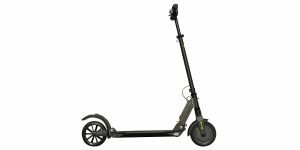 It seems there is a lithium battery version of this scooter, check it out here. The hub motor is intriguing. 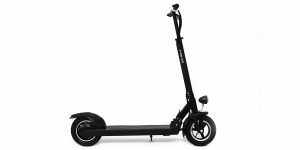 A reviewer seemed to enjoy the Vmoto scooter and posted a video here. 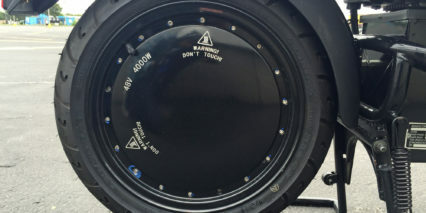 Hello, do you have reseller in Sweden? 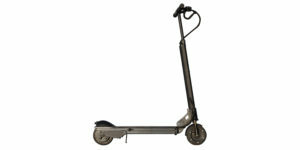 What is the price at E-max 120 with lithium batteries including shipping cost?